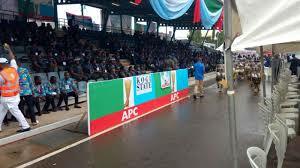 All progressive congress popularly known as APC is holding their sophomore National Convention today in Abuja, the nation’s capital, check our current event news articles for today. The convention is aimed at picking a leader that will runn the affairs of the party for the next 4 years. Comrade Adams Oshiomhole is a leading contender for the National Chairmanship position. While, Abdulmumin Abiola, son of the late MKO Abiola, is a top runner for the National Youth Leader position. As at Saturday morning, the party is yet to release the full names of contestants cleared to run for the offices. 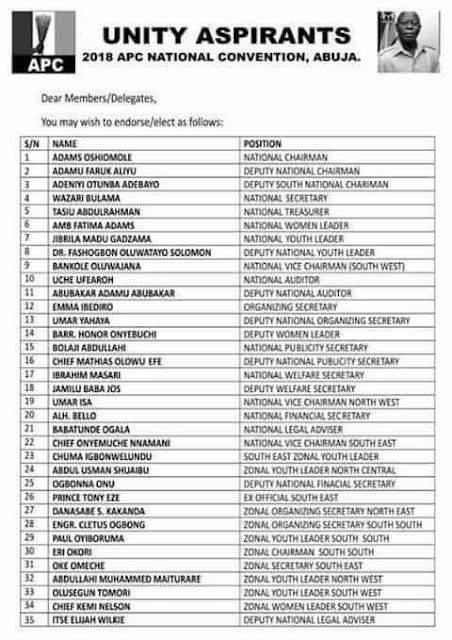 We learnt the inability to release this list is linked to efforts by the leaders of the party to allow the emergence of consensus candidates. We observed and reports that adequate security arrangements are in place within and around the Eagle Square venue of the convention. Activities are yet to pick up in full speed owing to light drizzly rains. Notwithstanding, delegates have been arriving and taking their seats. Senator Ovie Omo-Agege is one of the prominent personalities to arrive early. 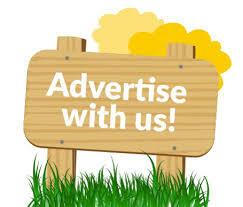 YTECH BLOG is currently live at the convention ground and would bring you live updates. The lawmaker representing Ondo North Senatorial District, Senator Ajayi Boroffice, has stated that the convention will foster a closer relationship among party members. This, he said, will position the party to deliver more dividend of democracy to the people. “After this convention, we are going to have a bond again in the APC that will begin to work for the people to such an extent that it will begin to deliver dividend of democracy to the people. 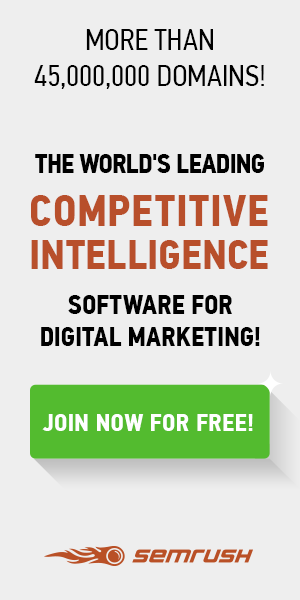 That is what we are looking for,” he told newsmen at the convention ground. YTECH CONSULT BLOG reliably gathers that the President, Muhammadu Buhari, who was initially expected at the venue at 1:00pm, will now be arriving between 2:00pm – 2:30pm due to the rains. His arrival will herald the commencement of the convention. 65 party positions are expected to be filled after the election. However, 20 positions have unopposed candidates while, 45 will be contested. Hajia Salamatu Baiwa has refuted reports that she has stepped down for Dr. Ramatu Tijjani Aliyu, the incumbent APC National Women Leader. A terse statement by her media office Saturday afternoon, appealed to Nigerians to ignore “the speculations”. “It has come to our notice that lies are being peddled about Hajia Salamatu Baiwa. “This is to inform our esteem supporters that we are still in the race and by the grace of God, victory shall be ours”, it read. At 2:30pm, Vice President Yemi Osinbajo, Senate President Bukola Saraki, several ministers, governors, senators, and other top government functionaries from the APC are already at the convention venue. They are moving round the stands, greeting delegates, politicking, and canvassing support for their preferred candidates. President Buhari and the outgoing party chairman, John Odigie-Oyegun, are yet to arrive. So far, the air around the Eagles Square is organised yet lively. 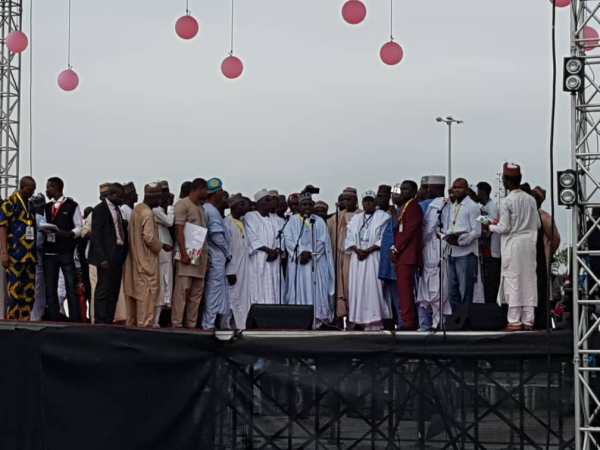 Some observers have described it as a carnival of a sort as state delegates display their local cultures and ‘aso-ebi’ attires. The APC National Convention has commenced in top speed following the arrival of President Muhammadu Buhari and the outgoing chairman, John Odigie-Oyegun. All dignitaries are recognised and seated. Governor of Jigawa State and Chairman of the convention committee, Badaru Mohammed, has delivered the opening remarks/welcome address. Badaru, who delivered his opening remarks shortly after the arrival of President Muhammadu Buhari and the outgoing chairman, John Odigie-Oyegun, said the convention was not only to elect new leaders but for members to fraternize ahead of the general election in 2019. He urged delegate to conduct themselves properly in line with the tenets of discipline and internal democracy. “I urge delegates to conduct themselves in line with the party’s principles of discipline and internal democracy as the convention has attracted global attention. “Let us give Nigerians a taste of what to expect in the coming general elections,” he told party members. Outgoing National Chairman of the APC, John Odigie-Oyegun, has addressed delegates at the convention. He said though naysayers thought the party was on the verge of implosion, the crowd at the convention shows the party is stronger and believes in its vision. “There are divergent views but the essence (of the convention) is that the APC is a strong party that believes in its vision and that of the President,” he said. Oyegun further thanked the founding fathers and all members of the party for the support given him. He further wished his successor well in piloting the affairs of the Party in the next phase. President Muhammadu Buhari casted his votes for new APC national leaders some minutes past 4pm. Delegates from his state, Katsina, were the first to vote. 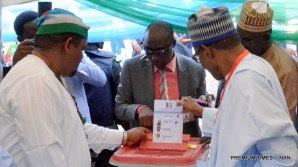 Buhari slotted in his votes at booth one of 10. Meanwhile, the president has charged delegates to continue to keep faith with the party. He told them to subjugate their personal interests for the party’s. President Buhari also tasked aggrieved members to give peace a chance. 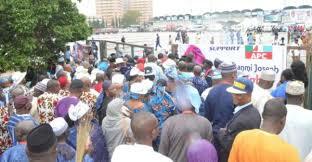 Some delegates at the ongoing APC National Convention have engaged each other in a free for all. Trouble started among delegates from Imo State before spreading to the Delta State delegates. While the clash between delegates from Imo was brought under control by security operatives after a while, that between the Delta delegates was more intense. Chairs were hurled and several people sustained injuries. This occurred despite the heavy security presence at the venue. The faction of the All Progressives Congress (APC) in Zamfara state loyal to Senator Kabir Marafa, have protested their denial of entrance into the Eagle Square, venue of the party’s national elective convention. Speaking with journalists outside the venue of the convention on Saturday, Muhammad Bello Bakyasuwas, said they fulfilled all the requirements for contesting for positions during the congresses which held in May but they are not recognised by the party. His words: “We belong to the legitimate APC faction in Zamfara state. The APC faction under the state chairman, Alhaji Surajo Garba Mai Katako Gusau. We were elected in the parallel APC state congresses of 5th, 12th and 19th May 2018 in Zamfara state. “We are here in Abuja to express our happiness, support and solidarity with our party over the national convention holding today to produce new national leaders for us. “We are in Abuja to witness this convention as Zamfara state national convention delegates and supporters of senator Kabir Garba Marafa, CON, for Governor of Zamfara State in 2019 and also supporters of President Muhammed Buhari for second term in 2019. “We are here with all our delegates and over one thousand supporters but we have been denied entry into the Eagle Square. So, we hereby appeal to our new national party leaders to be fair and recognize our faction as the legitimate APC leadership in Zamfara state. The faction’s spokesman said they would seek redress. “We are dully and legitimate elected executives of APC in Zamfara state. They stopped us because some of our supporters were wearing T- shirts with the photograph of our leader, Senator Kabir Garba Marafa,” he said.